They also destroyed the original data so that no one could ever check how closely their manipulated data set matched the actual numbers. Peel back the layers and this giant grab for regulatory power rests on little beyond the CRU’s manipulated data and tendentious arguments. “Climate change” theory as we know it is turning out to be a house of cards, with the East Anglia CRU at its base. Under the circumstances, it is important to remind ourselves that the discovery that the scientific enterprise was badly corrupted even at a pivotal institution doesn’t necessarily mean that the underlying theory is false or that all the science under the heading “climate change” is compromised. The public, feeling stung by the CRU revelations, may not be inclined to draw this distinction but responsible academics should draw it. We have a model of that approach in Stanley Trimble’s brief essay, “If the Science is Solid, Why Stoop?” in this issue. Trimble is a soil scientist, a professor of geography at UCLA, and a strong environmentalist who recognizes “Climategate” as “the greatest scientific scandal of my lifetime,” but doesn’t let indignation get in the way of scientific judgment. While keeping an open mind on the science, however, it is clear that the burden of proof must shift. For too long the proponents of the idea that human activity is significantly warming the planet claimed that their view was backed by “scientific consensus.” That alleged consensus was so great that—in the view of the theory’s proponents—scientists who persisted in dissent could and should be written off as cranks or, worse, individuals who had sold out their intellectual integrity to energy companies or other vested interests. “Consensus” also underwrote the view that the time for basic inquiry was over and that governments should move with dispatch to the stage of enacting and enforcing remedies for man-made global warming. The CRU emails, however, reveal that the “consensus” was fiction from the start. CRU researchers conspired—there is no other word—to prevent the publication of dissenting views and scientific results that contradicted the narrative they wanted to tell. They manipulated peer review and then brazenly declared that only work favoring their own conclusions passed muster with peer review. CRU became trapped in circular logic and a closed hermeneutical system. In the CRU microcosm, just as data contrary to the theory must be mistaken data and thus ripe for artificial correction, so too individual scientists who failed to assent to the master global warming narrative must be filtered out. Now, in the shadow of this false consensus backed by skullduggery and abuse of scientific standards, the only legitimate way forward for researchers in climate science is to wed themselves to skepticism. They need to eliminate the reliance on endlessly tweak-able computer models and return to a practice of making falsifiable hypotheses. They need to admit what they don’t know and fully to acknowledge the uncertainty inherent in the enterprise. The “precautionary principle” (which asserts that in the face of uncertainty about the climate, public policy should be shaped by the worse-case scenario) must be discarded. It is simply an invitation to intellectual mischief. And the idea of “scientific consensus” has been tarnished as well. Does widespread agreement or the absence of audible dissent make an idea true? Surely not. Most of us recognize that the truth of an idea depends on something more epistemologically solid than mere agreement. A statement signed by every scientist in the world declaring that the moon is made of green cheese would not transform the Sea of Tranquility into a plate of Sage Derby. I have to say “most of us,” however, because there are exceptions. We at NAS took note in 2007 when the American Association for University Professors (AAUP) published its report Freedom in the Classroom, which held that, within the university, “truth” is defined by the prevailing view within an academic discipline.5 It was a boldly cynical move on the AAUP’s part, but it served a purpose. By making “truth” an artifact of consensus within a discipline, it erected a wall of protection around such fields as women’s studies and post-colonial theory that trade more in authoritative-sounding pronouncements than in facts or ideas genuinely open to critical examination. The rhetoric of consensus can be manipulated either to silence critics, as CRU did, or to create a protected space for ideological subversions of free inquiry, which is what the AAUP attempts to do. Still the idea of “truth” has inherent power, and those engaged in devious forms of advocacy often try to avoid it. The other evening I attended a reception where I was cornered by a woman who insisted that the word “truth” was itself just an ideological claim, and that when the NAS says it stands for the “reasoned pursuit of truth,” we are making a right-wing political claim. She apparently lives in an academic universe similar to the AAUP’s vision in which the idea of a common truth has been banished in favor of endlessly roiling ideologies. It is worth keeping this relativistic horizon in mind when reconsidering the global-warmist claims of “scientific consensus.” If we are going to use the idea of scientific consensus at all, we had better make sure it is a firmer floor under our feet than we have seen in this case. But how much of anthropogenic global warming (AGW) theory is still being built on bowed joists and warped floorboards? As I write, heads of state, including President Obama and representatives of 170 nations, are gathered in Copenhagen for the aforementioned “Climate Summit.”6 The official goal of the event is to enact a “new climate protocol” to succeed the largely defunct Kyoto protocol, which expires in 2012. The Copenhagen Protocol aims to “prevent global warming and climate changes.” The theory on which this great multi-national undertaking rests, of course, goes back to the University of East Anglia’s Climate Research Unit. 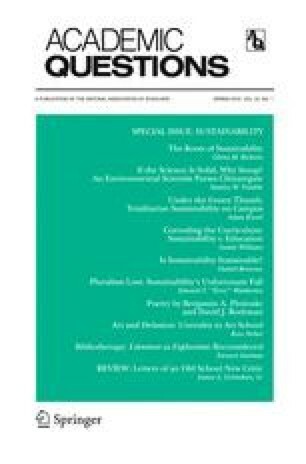 This special issue of Academic Questions focuses on “sustainability.” All of the articles here except Trimble’s and Wimberley’s were completed before the unauthorized release on November 19 of the CRU emails and computer code. None of them supposes the validity or falsity of “climate change” theory, though it is not hard to sense a certain degree of jaundice toward global warming claims. The absence of any more definite expression of skepticism was a decision I made two years ago when I first caught sight of the campus sustainability movement. I wanted to be able to assess the sustainability movement in terms of its tactics, its relation to academic standards, its effects on faculty members and students, and its ideological agenda—without getting caught in the debate over the “science” of global warming. The “science” debate had a way of crowding out any further rational discussion. And it seemed to be the key reason why virtually no one in higher education was willing to call the sustainability movement to account for actions that went far beyond anything with a legitimate scientific basis. I have corresponded with NAS members who are fully convinced that AGW is both real and grounded in good science. I repeat: they may be right. But the burden of proof has shifted. Those who wish to advance this hypothesis cannot expect to win any arguments with the trump card of “scientific consensus.” And a great deal of the structure of supposition and inference that has been built needs to be razed and the project begun again with better evidence and more transparency. The Enemies of Progress was not a bestseller. It didn’t give Al Gore’s An Inconvenient Truth: The Crisis of Global Warming any inconvenient competition or throw Earth in the Balance into disequilibrium. But Williams’s book deserves to be read and I am pleased that he contributed to this issue an essay, “Corroding the Curriculum: Sustainability v. Education,” which traces how “sustainability” curricula are driven in part by envy and jockeying for status among not-so-distinguished colleges. The University of East Anglia inevitably comes to mind. Adam Kissel returns to these pages with “Under the Green Thumb,” a very strong indictment of the totalitarian tendencies within the sustainability movement. Kissel doesn’t use the term lightly. Sustainability really does have followers who make a force majeure argument that the interests of defending the Earth outweigh every civil liberty. If we are seconds away from a epochal disaster that would ruin the planet, who has time for ordinary due process, let alone the leisurely pace of representative government? Short of this extreme, there are plenty of sustainatopians who see the best response to environmental peril as a vast expansion of regulation over all aspects of human activity. The totalitarian impulse is embedded in this approach too. Humans, according to this argument, are far too sloppy, heedless, and short-sighted to be entrusted with personal freedom or free markets. We need instead the wise stewardship of the enlightened few. Perhaps it is best to consider the burgeoning degrees programs in sustainability as proving grounds for would-be members of this elite. “The Roots of Sustainability,” our lead and longest essay, is a home-grown undertaking by Glenn Ricketts, NAS director of public affairs and also a tenured historian. My brief to Glenn was to fill a historical gap: How did the sustainability movement emerge out of the environmental movement? Are these two names for the same thing, or if they differ, how so? Academic and popular writings on the history of environmentalism and on sustainability are not in short supply, but overwhelmingly they represent the views of advocates and enthusiasts. There are some important exceptions: Charles Rubin’s The Green Crusade: Rethinking the Roots of Environmentalism (Rowman & Littlefield, 1994) and Richard J. Ellis’s The Dark Side of the Left: Illiberal Egalitarianism in America (University Press of Kansas, 1998). But Rubin and Ellis were a little too early on the scene to deal with how environmental extremism segued to sustainability. Ricketts has patiently scrolled back to the early 1960s, when Rachel Carson in Silent Spring (Houghton Mifflin, 1962) anointed a new kind of environmentalism, soon to be filled with ardor by such figures as Barry Commoner, Lynn White, Paul Ehrlich, and Charles A. Reich. The sustainability movement has often thundered forth definitions of “sustainability” as though it were in possession of both profound moral insights as well as impeccable scientific authority. But can these definitions—any of them—withstand genuine critical scrutiny? We asked a philosopher to give it a try, and the results are presented in “Is Sustainability Sustainable?” by Daniel Bonevac. Professor of philosophy at the University of Texas at Austin, Bonevac finds that many of the definitions offered by sustainability advocates rest on impossibilities, such as the fantasy of consuming today without affecting the choices of tomorrow. Other definitions of sustainability seem to be cogent abstractions devoid of any real substance. In contrast to the rhetorical flights of the sustain-o-philes, Bonevac’s essay is austerely rigorous, but I’m happy to add the flourish to his results: he shows that sustainability is a bucket with no bottom. It appears commodious—able to swallow up oceans, icesheets included, and Mount Kilimanjaro to boot. But that’s because it can’t really contain anything at all. All of the essays thus far come from scholars who position themselves as outsiders to the sustainability movement who examine it through the lens of polite but skeptical interest. In “Pluralism Lost: Sustainability’s Unfortunate Fall,” we present the reflections of a sympathetic sustainability insider, Edward T. “Terry” Wimberley, professor of ecological studies at Florida Gulf Coast University. His essay came to us at the last minute but seemed so pertinent that we had an actual stop-the-presses moment to include it here. Wimberley supports the concept of sustainability but unflinchingly recounts an all-too-real cautionary tale of what happened when one university carried it beyond the bounds of fair-minded intellectual pluralism. His essay is independent corroboration of numerous points raised by Trimble, Kissel, Williams, Ricketts, and Bonevac. We have two other essays in this issue that are not about the sustainability movement but focus on how well certain educational projects can be sustained. In “Art and Delusion: Unreality in Art School,” Ross Neher, adjunct professor of painting at Pratt Institute, observes the growing disconnect between the many fame-and-fortune dreams of art school students and the vanishingly small number of graduates who succeed in making careers as artists. The fated disappointment of most who supplicate the muse and hope for worldly success too is definitely not news, but Neher gives the story a vivid contemporary update by examining how art schools go about their business. The image of the art school classroom devoted to wordy postmodern theory rather than the charcoal stick and sketch pad is a reminder that academic fads wreak a long trail of destruction before they are ultimately spent. In “Bibliotherapy: Literature as Exploration Reconsidered,” Stewart Justman, director of the Liberal Studies Program at the University of Montana, Missoula, examines a textbook that has a generations-long career in persuading high school English teachers (among others) to mis-teach literary works. Louise Rosenblatt, one-time roommate of Margaret Mead at Barnard College in the 1920s, first published her textbook in 1938. She called for a more relaxed style of teaching literature that encourages students to find their own meaning in texts. Literature as Exploration has rumbled through numerous editions since, is kept in print by the Modern Language Association, and has legions of adoring fans among English teachers. Read their praise of the book on Amazon or other websites and it is hard to avoid the sense that these are the sorts of English teachers who have no real affection for good books, imaginative or profound writing, or difficult but rewarding prose. A seventy-some-year-old pitch to turn their classrooms into head sessions for teenagers struggling with whatever teenagers struggle with still seems fresh and compelling to many of our literature-averse, more-than-slightly-dim public school custodians of the literary tradition. Is it any wonder that recent high school grads these days respond with a blank stare at the mention of Nathaniel Hawthorne, Edgar Allan Poe, or Herman Melville? In his elegant essay, Justman takes us inside Rosenblatt’s oddly successful attempt to transform teaching literature into a species of therapeutic intervention in the lives of students. Rosenblatt is today lauded as a precursor of reader-response theory and other pedagogical vanities that attempt to make books interesting to people who have an immune reaction to actual literature. We round out this issue with two poems—one lightly satirical, one elegiac—by Benjamin A. Plotinsky and David J. Rothman, respectively, and “Letters of an Old School New Critic,” a review by Texas A&M University Regents Professor James A. Grimshaw of the letters of Robert B. Heilman, one of the founders of the New Criticism and an influential dean midcentury at the University of Washington. In “Corroding the Curriculum,” Austin Williams mentions a project at Southern Illinois University in which students are taught to grow earthworms. This is surely a small perfection of the idea of sustainability. Once college students could be airily dismissed as bookworms. But sustainability has grounded us in the humus of higher learning. Today we aim to make students into shepherds of the busy nightcrawlers, paragons of recycling. I have sometimes written of sustainability advocates as sustainatopians for their unrealistic and coercive visions of social and economic reform, and sometimes I have called them out as sustainabullies for their aggressive and gloating attacks on those who fail to get with the program. But I rather like the summary image of earth worms as the totem of this tribe: blind, voracious, lost to any sense of higher purpose in higher education other than their own insistent agenda, and definitely underfoot. “In one email, dated November 1999, one scientist wrote: ‘I’ve just completed Mike’s Nature [the science journal] trick of adding in the real temps to each series for the last 20 years (i.e., from 1981 onwards) and from 1961 for Keith’s to hide the decline.’” Leo Hickman and James Randerson, “Climate Sceptics Claim Leaked Emails Are Evidence of Collusion among Scientists,” guardian.co.uk, November 20, 2009, http://www.guardian.co.uk/environment/2009/nov/20/climate-sceptics-hackers-leaked-emails. United Nations Intergovernmental Panel on Climate Change (http://www.ipcc.ch/index.htm), Climate Change 2007: Synthesis Report, http://www.ipcc.ch/publications_and_data/publications_ipcc_fourth_assessment_report_synthesis_report.htm. United States Environmental Protection Agency (http://www.epa.gov/), “EPA Finds Greenhouse Gases Pose Threat to Public Health, Welfare,” news release, April 17, 2009, http://yosemite.epa.gov/opa/admpress.nsf/0/0EF7DF675805295D8525759B00566924. United States Environmental Protection Agency, Climate Change—Regulatory Initiatives, “Endangerment and Cause or Contribute Findings for Greenhouse Gases under the Clean Air Act, December 7, 2009, http://epa.gov/climatechange/endangerment.html. See also, EPA, “EPA Finds Greenhouse Gases Pose Threat to Public Health, Welfare”; Steven Mufson and David A. Fahrenthold, “EPA Is Preparing to Regulate Emissions in Congress’s Stead,” Washington Post, December 8, 2009, http://www.washingtonpost.com/wpdyn/content/article/2009/12/07/AR2009120701645.html. See American Association of University Professors (http://www.aaup.org/AAUP/), report, “Freedom in the Classroom (2007),” http://www.aaup.org/AAUP/comm/rep/A/class.htm. See United Nations Framework Convention on Climate Change, http://unfccc.int/2860.php. See my “Enchanting Sustainability,” www.nas.org, January 26, 2009, http://www.nas.org/polArticles.cfm?doc_id=519; Peggy F. Bartlett, “Reason and Reenchantment in Cultural Change: Sustainability in Higher Education,” Current Anthropology 49, no. 6 (2008): 1077–98. Austin Williams, The Enemies of Progress: The Dangers of Sustainability (Exeter, UK: Societas, 2008), 2.